We Say We Want to Help - But is Our Help the Right Kind? Take a moment and think about the types of stakeholders that our institutions in the development world typically feel accountable to. 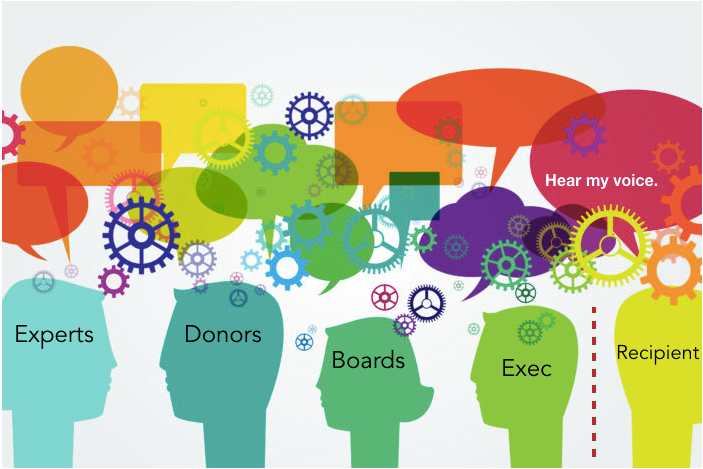 For many, the answer will most likely be donors, boards of directors, executives, company leaders, key staff members, and perhaps other partner organizations. This seems logical, as these are the actors that provide the funds, skills and visions for our institutions, and will therefore be the ones we feel a natural responsibility towards. But why are institutions not held accountable by those who actually receive our aid - the people whose lives we ultimately affect the most? If improving quality of life and restoring agency to those in need is the prime objective, how does it matter whether our donors, boards, leaders, and partners feel satisfied with our work, if our aid recipients don’t? There is a fundamental flaw in the way we attempt to solve global issues today. As institutions, we are wired to design and execute initiatives with the input and approval of every stakeholder in our ecosystem except the very ones who are the beneficiaries of our programs, the ones whose lives we supposedly are vested in improving the most. Aid recipients must have the opportunity to influence and make critical decisions on how we design solutions to the global challenges they face, not only because it is their lives we are trying to change, but also because they are bound to have the best understanding of their own pain and local context, as they live these issues, day in and day out. While they may not have an MBA or extensive corporate training, they most definitely have an unparalleled insight into the full landscape of the problems we are trying to solve for them, which no amount of research or academic training on our part could ever teach us. Providing communities with a chance to own the solution to their problems and inform us on how they know they can best be helped, rather than simply delivering solutions we assume will be best for them, is the most effective way to provide aid and solve our world’s challenges. This does not mean simply collecting surveys and conducting ‘research’ on what beneficiaries think or feel. It is not enough to empathize with these communities, have conversations with them, and/or simply get their feedback on our programs. Instead, we need to build truly diverse teams within our aid organizations that actively employ individuals coming from the very communities we seek to help, so that those voices are at the table, building our programs and running our organizations, weaving their perspectives into the very fabric of our work. When most institutions think about hiring a ‘diverse team’ of individuals, most often the focus is purely on racial and gender diversity. While this is a very important and significant concept to engage in, it is not enough, especially in the development world. As many in the field know, ‘diversity of thought’ is a treasured value in many teams- but we must understand what that actually means. It means that in our hiring processes, we must look beyond educational status, academic achievements and brand-name work experience. If I am working on building a program providing aid to villages in Ghana, not only must I hire those with backgrounds in program management, research and development, field experience, public service, and so on but, equally as important, is a candidate who may have none of those professional experiences and has instead grown up in the poorest parts of Ghana, and will eventually be able to openly provide the team with a genuine concept of the context of their village, what matters the most to those living there, how issues develop and perpetuate their communities, and how aid might be received on the ground - which arguably is the most important insight to have. While you might say that professional skills are most crucial for a development organization to have, as field perspectives and community voices can always be gathered in a feedback process later, I believe it should be the exact opposite. First, we must find and learn from those that live with these global issues in order to build a team with them from the ground up. Skills and professional experience can always be brought in at any time, but lived experience is critical, rare, and cannot be taught or learned. Therefore, it must be at the core of team-building within aid organizations. Not only will their insight immensely help in informing project development, it will also provide the communities we help with a sense of ownership over the aid they receive. Rather than going into another country, whose experience we ultimately don’t know first-hand, and implementing our thoughts and programs in their communities, we will instead be seeking to listen and learn from them, let them own and guide the creation of the resources they know they require and simply provide the skills, funds, and expertise to support their vision. At the very, very least, these individuals need to become the ones who have a final say on the work we do, because if solving humanity’s most pressing challenges is the mission of the development sector, we must feel ultimate accountability to those we aim to help, who experience the impact of our work and can honestly tell us whether or not we are succeeding in our missions. We must let go of our egos and our inherent assumptions that our ‘knowledge of the field’ means that we know best. Empowering individuals to solve the problem with us instead of us trying to solve it for them, is how we as a global community can truly lift up those around us.